Bude is at the focal point of the North Cornwall surf scene, the main surfing features of the coast in this area being long flat sandy beaches running north/south which give excellent beach breaks for beginners and experts. There are also a number of reef breaks in the area. Their locations are closely guarded secrets and are strictly for the experts as the whole coast is notable for dangerous rip currents and rocky cliffs. Buying and hiring gear is fairly easy and two adventure centres in the area will provide surfing and windsurfing tuition - for more details contact the local Tourist Information Centre. Duckpool - the first main beach break in Cornwall is situated on the shingle beach of Duckpool. West facing, it picks up any swell hitting the North Coast but is badly affected by westerly winds. Winds from the north and south tend to kick up a chop making it difficult to hold position. Not suitable for beginners. Along with Sandymouth and Northcott, Duckpool has numerous scattered rocks, therefore it should only be surfed around low tide. Hazards: rips when over 3ft (1 m); rocks. Sandymouth - the northerly end of the sandy beach running about two miles down to Bude. The beach faces west and works best with light easterly winds. Wave quality depends on the position of the sandbanks which can change from tide to tide. It is usually a typical beach break with no defined peaks. But watch out for the rip currents which can be ferocious in surf over five feet (1.5m). Not suitable for beginners. Northcott Mouth - the southern end of Sandymouth beach and west-facing. The rips can make it unsuitable for beginners unless the surf is small, but Northcott can deliver some punchy waves when conditions are right. Reached by walking from Crooklets beach in Bude or park at the end of the lane from Poughill. Crooklets - west facing and popular with locals, this works well in easterly winds and on all tides. Five minutes out of Bude, it is the first serious break on this coast. Wrangle Point, at the north end of the beach, throws off a good right. Hazards: rips at low tide when over 3ft (1 m). Summerleaze Beach - the town centre beach (west-facing) situated only a couple of minutes from the middle of town near the harbour breakwater. Worth a look when other places are blown out. As the tide rises the location of the break and its character alter. 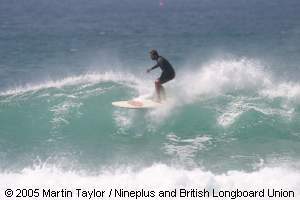 On low tide a fast left hander breaks outside the harbour and will hold a wave up to six feet (1.8m). As the tide rises a right hander will start to work off the end of the breakwater and at three-quarters to high tide, short rides can be had in front of the swimming pool. Hazards: rips at low tide when over 3ft (1 m). 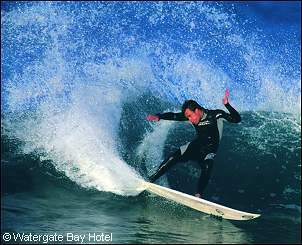 Widemouth Bay - the principal surf break in the area, attracting surfers of all ages and abilities on all kinds of craft. An ideal beach for learners although it can be hard getting outside the broken surf West facing, it works well at all stages of the tide but towards the high tide waves get faster and more hollow. Dawn patrols are particularly rewarding here, often giving glassy, uncrowded conditions. Boards are available for hire on the beach and tuition is available at two nearby adventure centres. Crackington Haven - this west facing beach works best from half tide up when the breathtaking 400ft (120m) cliffs give shelter from the wind. A good left breaks off the rocks on the southern side of the bay. Trebarwith Strand - west facing low tide beach break (sub-merged above mid-tide). Beaches here face mainly west and pick up most swells. Tintagel & Padstow possess all the facilities needed by visiting surfers, windsurfers and bodyboarders including campsites, accommodation and a surfshop. 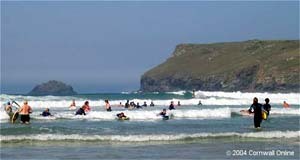 Polzeath - a popular west-facing beach-break, best on a clean swell with a light southeasterly wind. Works on all tides. Hayle Beach - a superb beach for beginners because the ride is long and works throughout the tide. Big winter swells can push right into the mouth of the Camel and can provide one of the only places on the North Coast that has any shelter from north westerly winds. Harlyn Bay - well worth a look when a big swell runs in south or south westerly winds. Three miles west of Padstow, Harlyn is a north facing beach which produces a suitable right hander at most stages of the tide off St Cadoc's Point on the east side of the bay. On big high tides it can turn into a nasty shore dump (best avoided by novices). Harlyn is also a suitable refuge when severe winds prevail as Trevose Head will shelter the bay from all but the strongest gales. Constantine Bay - a west-facing beach separated from Booby's Bay by a small rocky headland. In the centre of the bay, from mid-to-high tides, a wave breaks left and right in most swells. A better wave breaks off the reef at the southern end of the bay but this is much faster and not suitable for novices. Constantine also has some ferocious rip currents. Hazards: rips when over 3ft (1 m); rocks. Treyarnon - narrow west facing beach, best around low tide. Hazards: rips when over 3ft (l m). Newquay is the centre of surfing in Britain and has some excellent breaks, reefs and the greatest concentration of surf shops in the country. What makes Newquay such a good surf spot is that there are beaches running in every direction. It also features all the usual facilities and even a surf hostel for visiting surfers. Mawgan Porth - west-facing beach break situated four miles north of Newquay which can offer good fast waves in the river mouth when the sand bars are in the right place at low tide. It only really works in easterly winds. Watergate Bay - a two mile long flat sandy west-facing beach, popular with learners. When a large swell runs it also attracts locals because the paddle out is easier than at Fistral. The north end of the beach is often bigger, less crowded and more hollow in the middle. Whipsiderry - low to mid-tide beachbreak (submerged at high tide) particularly sheltered from south-westerly winds. Newquay Bay - Newquay's three north-facing town beaches - Tolcarne, Great Western and Towan join up at low tide to form a mile-long stretch of sand. At high tide they're submerged. Always popular, and often crowded during the summer, despite the waves tending to close out. Best around mid-tide, with a light westerly cross-shore. Fistral Beach - round Towan Head topped by the imposing Headland Hotel familiar to anyone who has watched the annual Surfmasters contest on TV, is Fistral Beach, probably the most famous British surf spot. The car park (pay & display) is approached from Headland Road and is signposted from the town. Fistral is definitely one of the best beach breaks in the country, north-west facing with fast hollow waves, particularly at low tide. Even in on-shore conditions the wave still holds shape and power. With a south-easterly wind there are good tubing sections. Off Towan Head, the Cribber Reef breaks in big winter swells and provides a big challenging wave for the experts. Hazards: rips when over 4ft (1.2m). Crantock Beach - a mile south of the town this is a north west facing beach sheltered by East and West Pentire Points. Worth a visit when other beaches are blown out, the waves are best at mid to high tide. Hazards: rips. Holywell Bay - north-west facing beach, best around low tide. Hazards: rips when over 4ft (1.2m). The final stretch on the North Coast runs from Perran Bay to Portreath. Perran Bay - a west-facing beach just north of Perranporth. It produces a good wave and is an excellent location for the lone surfer as the walk over sand dunes puts many surfers off. 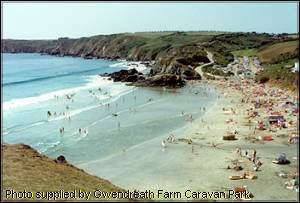 Perranporth - a busy beach in the summer, it is an ideal learning location for surfing although rip currents are present at either end of the beach. A surf and hire shop will provide the necessary items for expert or novice. Penhale Corner - offers surfing in sheltered winds. Hazards - rips when over 4 ft (1 .2m); MoD firing range at the top of the cliffs above Penhale Corner. Trevaunance Cove - north-facing beachbreak which works in big swells and sheltered from westerly and south-westerly winds. Predominately rights breaking away from the rocks in the middle of the cove; best around low tide on a small swell or around mid tide when it's over 4ft. Always crowded when its good. Chapel Porth - a tiny west-facing beach at high tide which gives some good lefts and rights, breaking fast over the sandy bottom from low to mid tide. Hazards: rips when over 3ft. Porthtowan Beach - just south of Chapel Porth and situated at the end of a long deep valley. The beach faces north west and when the sand bars line up it can produce an excellent tubing wave at all stages of the tide. If the wind is south-easterly it tends to blow along the valley and gives good off-shore winds which keep the wave steep. Hazards: rips when over 3ft. Portreath - four miles north of Camborne this north-facing beach is sheltered from south westerlies Big swells are needed but the beach can hold a good wave up to about six feet towards high tide. On big swells a heavy right hander breaks on the harbour wall at high tide but this should only be attempted by experienced surfers. Hazards: rocks. Gwithian - In light winds Gwithian has a large following as a surfing beach creating some ideal surf when almost any swell is in the Atlantic. Gwithian can hold larger surf than most of the surrounding areas although this is not for the faint hearted during winter months. Hazards: rips when over 4ft (1.2m). Carbis Bay - is only surfable when huge swells are running. The small rocky point in the middle of the beach can produce a good wave on its day, although generally the large headland to the west protects this beach making it a busy tourist location during summer months. Porthmeor Beach - St. Ives' main surf spot, north facing and picking up a good swell. If the wind has any south in it, it will be offshore here and will throw off good punchy lefts and rights all through the tide. A popular tourist beach and the location for the Tate Gallery, St Ives. This is a good place for beginners. Hazards: rips when over 4ft (1.2m). 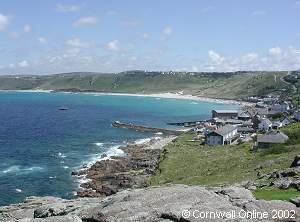 Further west is Sennen Cove, one of the most exposed beaches in the country, which will pick up any swell moving across the North Atlantic. The beach is split into two, Gwynver and Sennen. Gwynver, at the northern end, is best reached by walking round from Sennen along the cliff path although there is a small car park along the small lane leading past Escalls Farm from the A30. The beach works best from low to mid tide and strong rips make it unsuitable for beginners. Sennen is similar to Gwenver, working up to 6ft (2m) from low to mid tide although there is often a fast peaky wave at high tide. The rips are strong and beginners should check with the Lifeguards if the surf is very big. On huge days, check out the waves breaking on the Cowloe reef, off the lifeboat jetty, from the top of the cliffs south of the town. Hazards: rips when over 3ft (1 m). Porthcurno - small south-east facing cove, one of the few spots where north-westerlies blow offshore. Works on a south-westerly (or big westerly swell, only on very low (spring) tides. Not suitable for beginners. Hazards rips when over 3ft (1 m). Praa Sands, Perannuthnoe - south-west facing beachbreaks which work on southwesterly swells when the wind is from the north quadrant. Fast, sucky waves breaking close to the shore, best from mid to high tide. Porthleven - right-hand reef break (see above), situated just west of the harbour entrance. Holds waves up to 12ft (3.7m). Ideally it needs a big westerly (or south-westerly) swell, plus a north-easterly breeze: consequently it doesn't work very often. Best from mid to high tide (dangerously shallow at low tide); must be over 4ft (1.2m) to break clear of the rocks. Another reef at the end of the harbour wall is sometimes good at low tide giving short, hollow lefts-and-rights; again dangerously shallow. Experts only. Hazards: rocks. Kennack Sands - south-east-facing beachbreak, best around mid-tide. Works on big south-west swells, and on south-east swells. Pentewan Beach - south-east facing beachbreak best around mid-tide. Works on south-east or huge south-west and swells. Hazard; rips. This scenic beach is perfect for the non-enthusiast as well, as is the holiday park which his all the amenities including a licensed bar and a games room for youngsters. 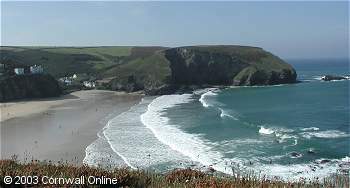 Whitsand Bay - long south-west facing beach offering average waves, best at low tide. (01208) 862162 - For all your surfing needs!! (01288) 321765 - Specialising in outdoor pursuits you are guaranteed top class tuition with qualified tutors. (01841) 520250 - Providing equipment and expertise to make your surfing experience as easy as possible. 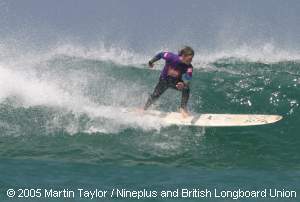 (01841) 521395 - Surfing courses with proffessional coaching. (01841) 521185 - For all your surfing needs!! (01288) 362900 - delivering high quality programmes to suit your needs. (01288) 352451 - Tailor made courses catering for your needs & with the aim to improve you knowledge of watersports. (01208) 863426 - For all your surfing needs!! (01208) 862003 - Change your life forever! (01288) 354956 - For all your surfing needs! !